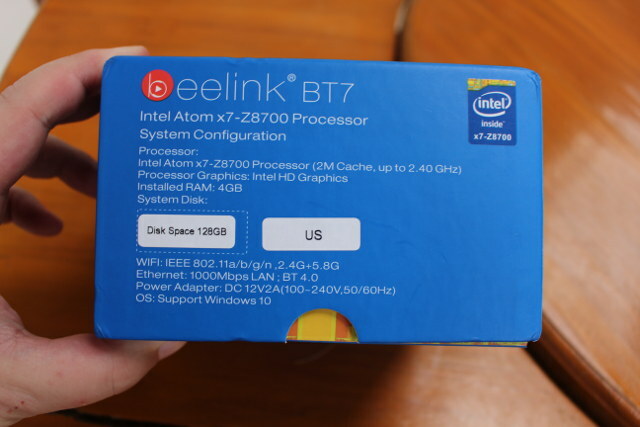 Beelink BT7 is one of the few mini PCs based on Atom x7-Z8700, the fastest Intel “Cherry Trail” processor on the market, and should provide a decent alternative to Voyo V3 for people wanting an Ethernet port, and better cooling. The company sent me the version with 128 GB eMMC flash and 4GB RAM, and before reviewing the tiny computer, I’ll post some pictures and check out the hardware, especially the thermal design. 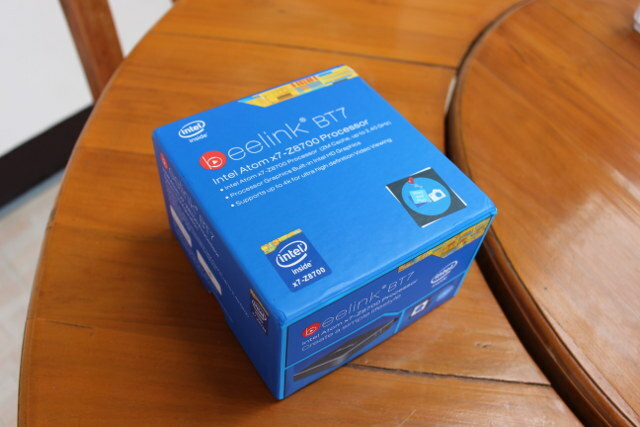 The package looks very similar to Intel NUC retail packages. It will show the complete specs, with highlights for Intel Atom x7-Z8700 processor, and 4K display support. The mini PC ships with a 12V/2A power supply (US, UK, EU or AU as requested, a short HDMI cable, a not-that-long HDMI cable, a VESA mount kit, a “user operations guide”, and a disc with Windows 10 drivers. The latter is really a plus, as I’ve seen several people looking for Voyo V3 drivers. The VESA mount is also nice if your monitor support it. The device has a metal look, but I think the case material is really some sort of plastic (TBC). I’ve been told its an aluminum case. 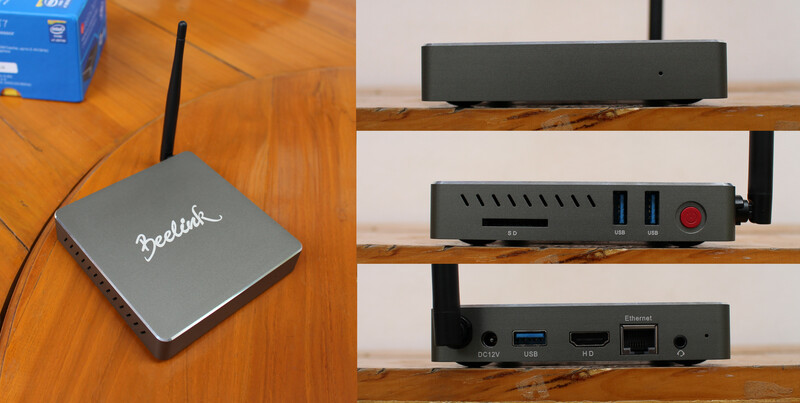 The front panel only has a small hole for the power LED, while one side comes with an SD card slot, two USB 3.0 ports, and the power button, and the rear panel features the WiFi antenna, the power jack, one more USB 3.0 port, HDMI 1.4 output, Gigabit Ethernet, and one headphone jack. You may want to watch the unboxing video for a few more details. Opening the device is straightforward, as it’s the usual procedure to remove the rubber pads, and loosen four screws. The bottom plate will then fall down easily. A thermal pad is placed in the middle of the bottom cover to provide some more cooling. 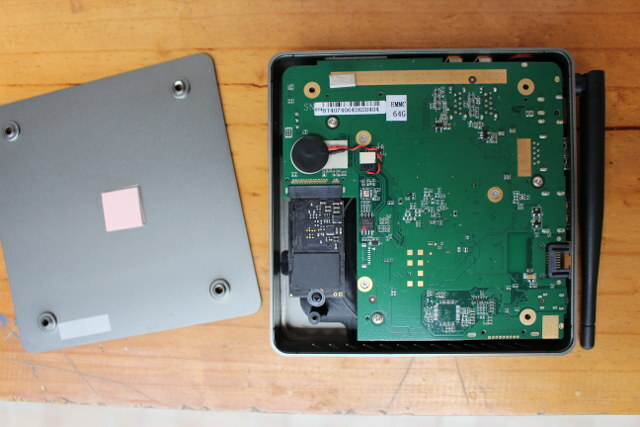 The bottom board has the SSD module, the RTC battery, and a sticker with the SSD capacity. Wait… 64GB? But the package reads 128GB. So they’ve clearly made a mistake here, and you may want to double confirm the capacity in Windows, if you order this device. It turns out all model have a 64GB eMMC flash, so the 64GB SSD brings the total storage to 128GB in the model I have. I removed four more screws to complete take about the board. The cooling solution looks pretty good to me with a fairly large copper heatsink, and a small heatsink. The cushions around the fan will make contact with the top cover, but they won’t conduct heat to the case. A close up on the board reveal some of the chips used including Asmedia ASM1061 PCIe to SATA bridge which should deliver very good SATA performance, at least compared to other USB solutions, Realtek ALC5651 audio codec, GST5009 magnetics module and another Realtek chip (partially hidden under the heatsink) for Gigabit Ethernet, and what should be 8203 HDMI 1.4b level shifter. 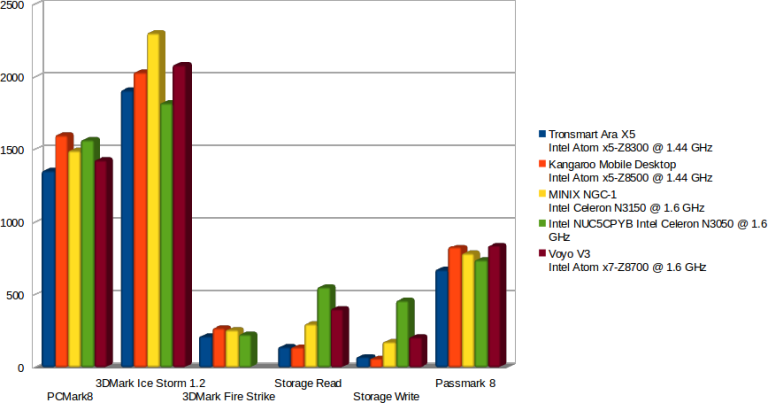 The M.2 SSD has indeed a 64GB capacity, and is based on SM2246XT SATA controller. You can find more information and contact the company for volume purchase on the product page. 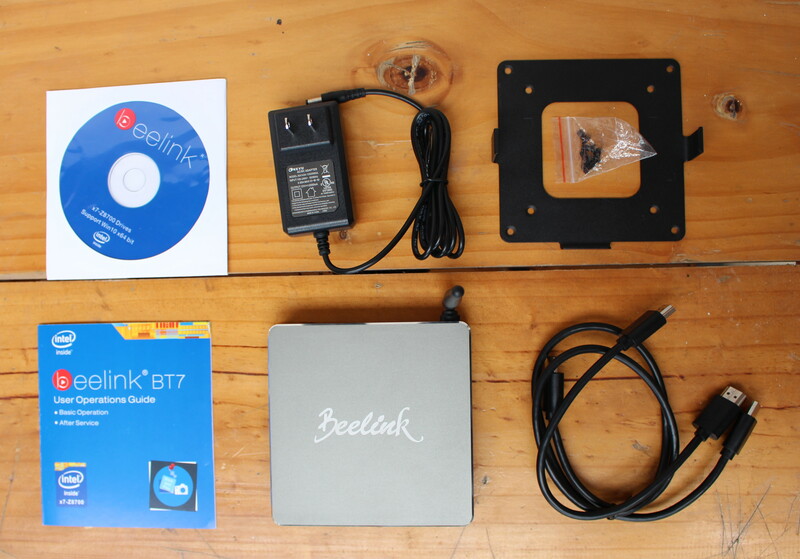 Individuals can purchase Beelink BT7 on Gearbest for respectively $168.99 (64 GB – coupon: GBBT76), $195.99 (128 GB – coupon: GBBT72), and $249.99 (320 GB – coupon: GBBT73), but it can also be found on Banggood and Amazon UK for now. Too bad it has a fan. 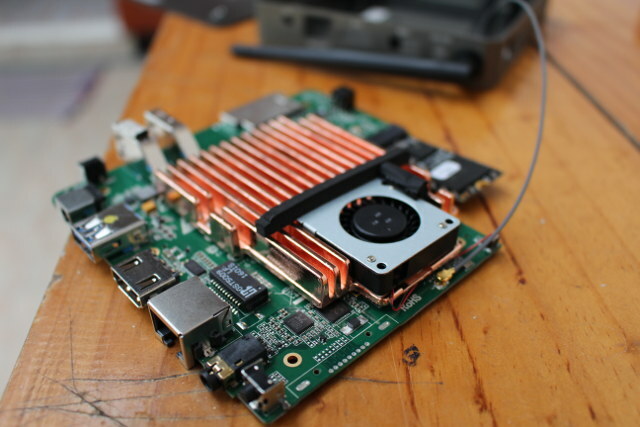 They should rather design a metal case and use it as heatsink. For one who’s looking for fanless mini pc comes with aluminum enclosure and rich connectivity, just search aliexpress with “n3150” keyword. the manufacturer of SSD m-SATA is beelink too? The ASM1061 is a standard “third party” SATA controller that’s close enough in performance to an Intel SATA controller, at least in this case, so you should see full SATA performance from this thing. Also, any chance you have an M.2 SSD you could try and swap out that silly MMC drive with? It should really boost the performance. Yeah, i checked those Hystou mini pc couple of years back, but the Intel i5 seemed a bit expensive at that time. How would these Braswell Celeron compare against this BT7 Atom CPU? Sorry, no spare M.2 SSD here. 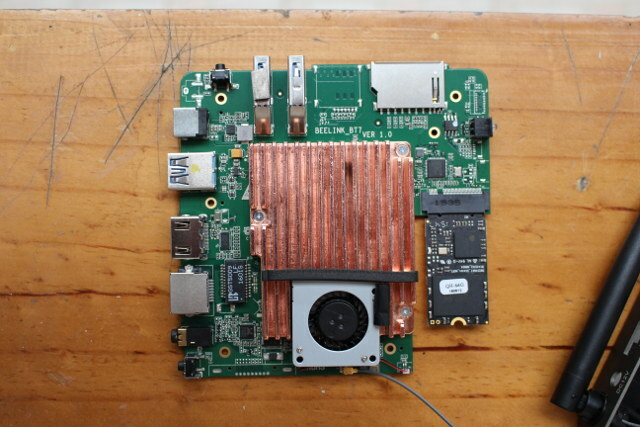 I’m expecting Beelink BT7 to be slightly faster than Voyo V3 thanks to the large heatsink and fan, unless the SSD is not quite as fast. Finally, my model has 128GB storage. That’s because beside the 64GB SSD, there’s also a 64GB eMMC flash. I have not measured it, nor tried to remove the fan. But if you look at the picture you’ll see the screws position is a bit different, so it’s unclear if it is easily replaceable. I noticed those screws and was thinking they are possibly just holding the metal cover on the fan… maybe? Maybe, it needs to be looked into / tried. Hi people. I have just bought also one of this and I find a little annoying the fan so I was reconsidering also to chnage it. Any suggestions like @Alex? It worked? Also I have it in constat run and in the last days I found that the BT7 has rebooted I dont know why Any of you had the same issue? Thanks! Any idea about the 64gb version drive? Is it 32gb eMMc and 32gb m.2? Or is it 64gb eMMMC only, with nothing on the M.2 slot? I don’t know, but if I had to speculate, I’d assume all models use a 64 eMMC flash since that would seem the easier way for production. Do you think it would be possible to cut a hole in the box and use the BT7’s internal SATA connection to power an external SSD? It surprises me they would go for such a small SSD instead of an eSATA connector to outside the box. It seems like they are aiming at the set top box / light use home PC market. I don’t understand why you would bother with a 64 Gb SSD in the box when you could have the heat outside of the box with an eSATA connection and let the user have his whole video library out there. My original purchase was a BT7 with no SSD. I took the BT7 apart (as shown in this article) and inserted a ZTC 256GB Armor 42mm M.2 Solid State Drive. I transferred Windows 10 to the SSD with MiniTool Partition and it worked great. The SSD was $83 from Amazon. I have very stupid problem. That being, that I cannot remove the bottom plate. It is like it has been wedged in under high-pressure. but I bought this with the intention to change the fan and the SSD. so, does anybody have an idea how to solve this? Once you’ve loosen the four screws, it should fall off. If not, try to tap on the other side to make it fall off.